New Delhi: The Union Cabinet gave approval for introduction of the Dentists (Amendment) Bill, 2017 in Parliament, subject to modification of drafting or consequential nature, as may be considered necessary by the Legislative Department by amending the Dentists Act, 1948. According to an official statement, the clauses being amended pertain to certain modifications in the provisions of the Dentists Act, 1948. The two major clauses which are being amended including membership of the Dental Council of India under clause (f) of Section 3 and membership of State and Joint State Dental Councils under clause (b) of Section 21 and clause (b) of Section 23 of the Act. As per the existing Act, it was required to have the representation of dentists registered in Part B as Central Government nominees in the Dental Council of India and the election of either four or two members from Part B to the State/Joint State Dental Councils. However, it has lost relevance. The Cabinet, chaired by Prime Minister Narendra Modi, approved the amendment to decrease redundancy of the provisions so that their representation does not remain mandatory anymore, it added. 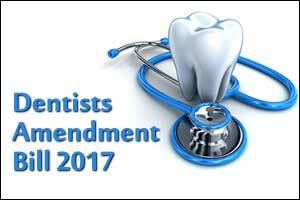 “PROPOSED AMENDMENTS FROM DENTAL Fraternity”. Proposed amendment I • PROPORTIONATE RATIO REPRESENTATION. 1:2000 Repesentatives:Members registered in Any state council. Present Clause. No SuMoto powers to Central or State councils. Proposed Amendment. Judicial Powers to take action in case of non compliance of Dentist Act. Present Clause. Chapter III Clause 27(1) Term of Office is five years(Elected Members) Two years( Nominated members) or until his successors is duly elected or nominate, whichever is longer. till elections are held. Proposed Amendment. Fixed 5/2 term at the end of term even if elections are held or not the members either nominated or elected has deemed to have ceased being a member. Present Clause. No bar in holding the office for Any Number of terms. Proposed Amendment. Bar from contesting for next term. A gap of one term is compulsory. Present Clause. Chapter III 28(1) (a) Appoint a registar who shall also act as secretary and if so decided by the (State) council as its treasurer . Proposed Amendment. ADD TO THE CLAUSE; Only a Dentist who is registered in the said Dental council can be a registar. Long awaited amendment. But the Part A rep has to be increased. The part B register was closed long back which had 4 reps elected even though they were mostly dead or had were in very less Number. Part A we will have 4 reps which has to be elected. I wanted that the govt Instead of 4 makes it 1:2000 members registered in Any state council. I have written to the GOI Reg removal of Part B reps and also Reg the increase of Part A reps. . It’s a half job done. I wish all of us use ur good offices and also write to GOI and increase the reps in Part A.